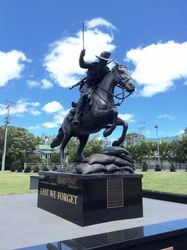 The monument commemorates the Centenary of ANZAC and is a tribute to the those who fought in World War One and the 160,000 horses that went to war. It also honours those who have died in all wars. 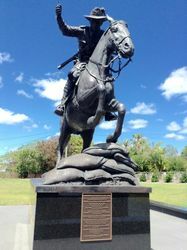 The statue depicts a mounted trooper of the Australian 5th Light Horse Regiment during the Battle of Beersheba in October 1917 during World War One. The battle of took place on 31 October 1917 as part of the wider British offensive collectively known as the third Battle of Gaza. The final phase of this all day battle was the mounted charge of the 4th Light Horse Brigade which consisted of the 4th, 11th and 12th Light Horse Regiments. Commencing at dusk, members of the brigade stormed through the Turkish defences and seized the strategic town of Beersheba. The capture of Beersheba enabled British Empire forces to break the Ottoman line near Gaza on 7 November and advance into Palestine. Two black granite walls depict a World War One trench. 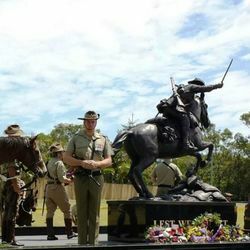 The Light Horsemen bronze statue represents a trooper jumping over that trench on his way to battle. 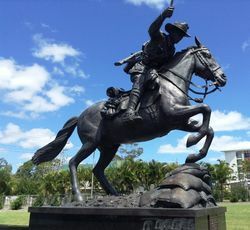 The statue was created by artist and sculptor, Mark Snell. Perides Art Foundry transformed the works from clay to bronze. are honoured and remembered each ANZAC Day. However, let us not forget the help they had through those horrid times. Australia's finest `Walers` they were called. Strong, sturdy and faithful war horses. Thousands of them were sent. to carry our men into battle. ANZAC feats, now legends, would not exist. were not going to be allowed back into Australia. nor the men they served with.